I would like to thank Rosewill for supplying the review sample. Rosewill has a full line-up of computer accessories, upgrade parts and cases. 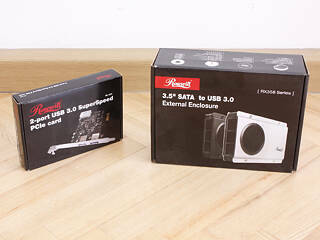 Today, we will be taking a look at the Rosewill RX358 USB 3.0 equipped hard drive enclosure today. On top of that Rosewill has sent us a USB 3.0 PCIe x1 card, which we will use in this review as well. The enclosure is available in black or silver and features an active fan and utilizes aluminum and steel. 7.59" x 4.92" x 1.77"